On the relations between Christians and Muslims, Europe and the Middle East, as symbolized by the outcome of French invasions of Egypt in 1249, 1798, and 1956. From In the Path of God: Islam and Political Power (1983), pp. 98-101. The better to visualize the Western impact [on Muslims], let us begin with the paradigm of France and Egypt. On three occasions, Egypt has been attacked by France and the results of their encounters can serve to symbolize the relations between Europe and Islamdom as a whole. 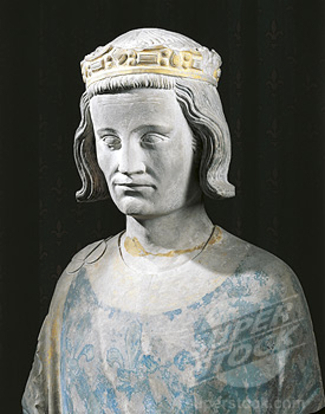 One representation of King Louis IX of France. The first assault, which typified the premodern situation, occurred in 1248 when the king of France, Louis IX (better known as Saint Louis) led the last Crusader expedition seriously to try to take Jerusalem from the Muslims. Jerusalem being under the control of the Ayyubids, a dynasty based in Egypt, Louis devised a plan to capture the Egyptian coastal city of Damietta and then return it in exchange for the holy city. French forces did take Damietta in June 1249, but then, buoyed by this success, Louis made the mistake of trying to invade the interior of the country and to destroy the Ayyubid dynasty altogether. The attack went awry, Louis and many French soldiers were captured in April 1250, and, as part of the deal to ransom them, the French forces evacuated Damietta. King Louis and his troops then fled from Egypt to Syria. Crusaders and Ayyubids faced each other as approximate equals. Their technology, wealth, and cultural levels differed little; they disposed of roughly the same military power; and religious passions motivated both. The French attacked Egypt as Christian believers intent on winning Jerusalem from heathens. The Ayyubids responded in kind, seeing themselves as defenders of Dar al-Islam. Although the two sides were matched in power and ideology in the thirteenth century, this parity was subsequently broken. West Europeans harnessed their economic potential, scientific capabilities, and social institutions to develop their civilization in unprecedented ways; this process, known as modernization, began in the sixteenth century and proceeds Unabated to our time. Two aspects of modernization concern us most: military power and political culture. Military strength did not result just from new weapons and strategies, but from much else as well. European governments gained greater stability as a result of elections and parliaments; they commanded more loyalty from their citizens through political parties and new ideologies; the proliferation of public schools, universities, mass publishing, and the news media endowed Europe with great cultural advantages; the business corporation, limited liability partnership, and stock exchange enhanced the effectiveness of capitalist institutions; paved roads, canal networks, railroads, and the telegraph brought everything together. Europeans were strongest because they were the most civilized, the richest, and the healthiest people in the world. At about the same time as Europe became so powerful, its culture underwent a process of radical secularization. The eighteenth century saw a re-orientation away from Christianity and toward the development of a nonreligious civilization, making what the Franks had to offer non-Christians far more attractive than before. Muslims seeking guidance found answers in the religiously neutral ideas coming from Europe; for the first time, they could learn from Europe without having first to undergo conversion. Their relationship to the Franks became totally altered as European culture developed from religious rival to seductive ideology. The French Revolution epitomized both the military and cultural changes that had taken place: while French armies crushed their opposition, French ideas won a wide following throughout Europe. Muslims too became involved when the French landed in Egypt for the second time, five and a half centuries after Saint Louis. On 1 July 1798 they appeared without warning on the coast near Alexandria. 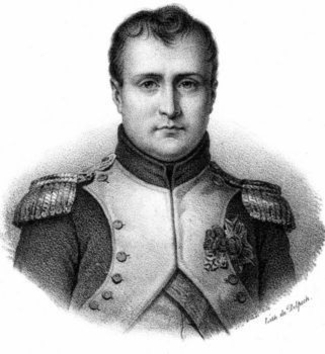 Commanded by Napoleon Bonaparte, who saw this expedition mostly as a way to keep himself and his troops occupied, their mission was to take Egypt and thereby cut the British off from India. French soldiers immediately captured Alexandria, then within three weeks they crushed the Mamluk forces outside Cairo. Napoleon's troops encountered no serious opposition during their blitzkrieg and easily took control of the Nile Valley. Only another European power could have stood up to their overwhelming force—and this indeed happened days later, when British ships destroyed the French fleet waiting outside Alexandria on August first. The French forces, cut off from Europe, stayed on in Egypt for three more years, until compelled to evacuate by the British in October 1801. The disparity in military power between the French and Egyptian troops was enormous—Napoleon's army enjoyed total supremacy in every respect, including tactics, strategy, weaponry, communications, command hierarchy, discipline, and provisioning. If anything, the disparity in political outlook between the two sides was even greater. Egyptians still viewed their enemy as Christians and as religious foes; the only claim to legitimacy of the Mamluk government in Cairo was its ability to keep kafirs out and to apply the Shari'a. In contrast, the French forces almost ignored the religious dimension of the conflict. Napoleon saw himself not as a Christian conqueror but as a friend of Islam and the downtrodden Egyptians. On his arrival in Egypt, he distributed a manifesto in Arabic proclaiming the Mamluk rulers as the real enemies of Egyptians. To win popular support, he established French forms of local government and ruled the country with the Egyptians' welfare in mind. Further, although Napoleon had little patience with Christianity, he did express sympathy for Islam and showed interest in it. Such tolerance was not confined to Napoleon himself; Baron J. F. Menou, who took over as commander of the French expeditionary forces in June 1800, actually converted to Islam and became known as Abdulla Menou. The armies of Napoleon represented a new force in politics, a popular army run by leaders claiming to represent their people in the service of a political ideology. Christianity and Islam were irrelevant to the revolutionaries, who fought for the glory of France and for liberty, equality, and fraternity. National interest and ideological fervor counted far more than religion. If Egyptian forces had changed little in military capabilities or world outlook over the centuries, the French army had been transformed in both respects. But this power gap could not continue; having seen what Europeans could do, the Egyptians quickly imitated them. Egypt's first Muslim ruler after the French invasion was Muhammad 'Ali, an Ottoman officer of Albanian origin who was garrisoned in Egypt; as a witness to the French occupation, he recognized that modern techniques could enhance his own power. With this in mind, he embarked on a crash program to raise Egypt's military and economic capabilities to the level of Europe's. Recruitment, military training, drill patterns, tactics, and command structures were all copied from the French, as were land surveys, hydraulic planning, disease control, industrialization, and taxation. Muhammad 'Ali assured himself the best and latest techniques by sending Egyptian students to France and employing Europeans in Egypt. He sponsored other innovations too, such as an Arabic printing press, a medical school, and a government newspaper. 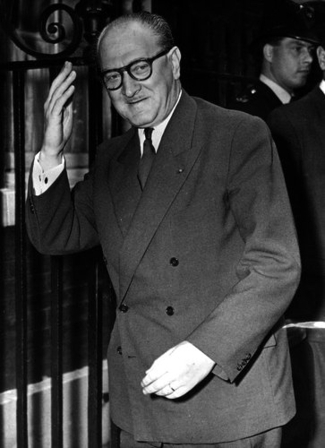 French prime minister Guy Mollet. The changes begun by Muhammad 'All were continued by his successors, who made concerted efforts to learn methods from Europe to modernize their country. The effects of this could be seen in 1956, when France invaded Egypt for the third and last time. This attack was occasioned by two events: Egypt's president, Gamal Abdul Nasser, nationalized the Suez Canal in July 1956, much to the dismay of its French and British shareholders; then, from 29 October on, Israeli forces overran the Sinai peninsula in an effort to stop the attacks emanating from there. Franco-British paratroopers landed in the coastal city of Port Said on 5 November, ostensibly to protect the canal from the effects of Israeli-Egyptian fighting, but really in cooperation with Israel. By the seventh of November, French and British troops had advanced to Ismailia, thirty miles to the south of Port Said. As in 1798, Egyptian defenses gave way, but this time the government in Cairo mobilized international support, American and Soviet especially, and forced the Europeans to halt. By the end of December 1956, all the foreign troops had been evacuated. Once again, the French had failed. In 1798, only Britain could stand up to France; in 1956, the two together failed. Egypt had made great progress. Its government in 1956 claimed to represent the nation and it pursued nonreligious ideologies derived from Western sources, including socialism, neutralism, democracy, and social justice. Egypt had acquired leaders intent on forwarding the country's national interests and ceased to be a playfield for foreigners. Overtones of Christian-Muslim hostility still remained in the Suez conflict, but they were not explicit, nor were they critical; on both sides, the issues were those of national rights, economics, and relations with the super-powers. Three times in seven hundred years, similar events had occurred: France invaded Egypt each time, won initial successes, penetrated the interior, met defeat, beat a hasty retreat, and left the country empty-handed. But beneath the similarities of the expeditions to Damietta, Alexandria, and Port Said, fundamental changes were taking place in the relations between these two countries. Both the French and the Egyptians saw their confrontation in religious terms in 1248; the French evolved a military power and an ideological approach to politics which stunned the Egyptians in 1798; and by 1956, the Egyptians had learned enough about modern ways to outmaneuver the French in international politics. The three invasions symbolized premodern parity, the European surge, and the Muslim catching-up. The crushing defeat of 1798 and others like it elsewhere in Dar al-Islam compelled the Muslims to observe the Franks carefully and to learn from them; one and a half centuries later, they had partially succeeded, for although still inferior in power, they had absorbed European ideas.